The city of Seattle should end its lawsuit pursuing an illegal income tax, which was decisively rejected by a judge. There are better ways to start a conversation about Washington tax reform. 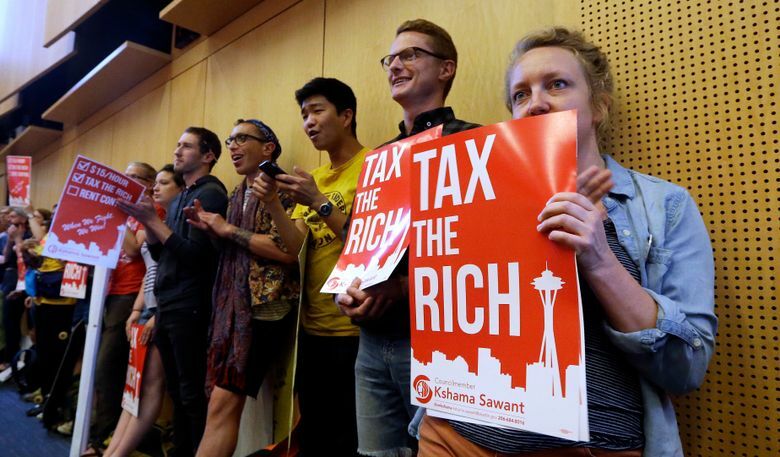 Seattle should abandon its costly and wrongheaded pursuit of an illegal income tax. A judge last month eviscerated the city’s legal justification of the high-earners income tax, affirming that cities in Washington have no authority to impose income taxes. Seattle officials should not appeal. The city cannot afford such political vanity as long as it has broken sidewalks, underfunded social and police services, a backlog of park maintenance, and libraries that aren’t open regular hours. There should be a thoughtful conversation about Washington’s tax system — at the state level, where any substantial changes must be deliberated and approved. Seattle is a poor choice to instigate this conversation. The city has yet to provide a convincing argument for why it needs an income tax, other than to make a political gesture. Seattle is rolling in revenue compared to most jurisdictions. Its newly passed 2018 budget increases spending 27 percent over 2014 levels, far outpacing population growth. Seattle officials’ argument for the tax — concern about the tax burden on those with moderate income — rings hollow after all the regressive taxes they’ve imposed on those people in recent years. They made no firm commitment to cut any regressive taxes or spend less. All that’s certain is their desire to layer on more taxes and increase spending. The City Council unanimously approved the 2.5 percent income tax in July. It would apply to income above $250,000 for individuals or $500,000 for couples. If allowed, this would jeopardize economic opportunity in Seattle. Business owners and entrepreneurs who create jobs and offer upward mobility to workers would be more likely to move and start or expand companies elsewhere. Seattle already taxes business heavily. Its 2018 budget expects general-fund revenue from business taxes to increase 20 percent and from business-license fees to increase 40 percent since 2016. Remember, it wasn’t Seattle officials’ idea to pick a legal fight over the income tax. They were urged to do so by a labor-backed advocacy group that looked around the state for a compliant city to carry its water. Their tortured legal arguments and semantic games to justify an illegal tax were demolished by King County Superior Court Judge John Ruhl in a summary judgment last month. “Regardless of what label one may choose in classifying the city’s tax, the requirement remains that the Legislature must specifically authorize the tax,” Ruhl wrote. The same point was made Thursday by the state Supreme Court, when it rejected tax preferences in the city of Spokane. The ruling said taxes must be uniform — not tiered — under the state constitution, and cities need tax authorization from the Legislature. Seattle should drop this dead-end case and find better ways to advance the worthy conversation about inequality and inequity. An obvious place to start is by examining the economic burden of the city’s current taxes and the relationship between taxes, a lack of fiscal restraint and the cost of living.